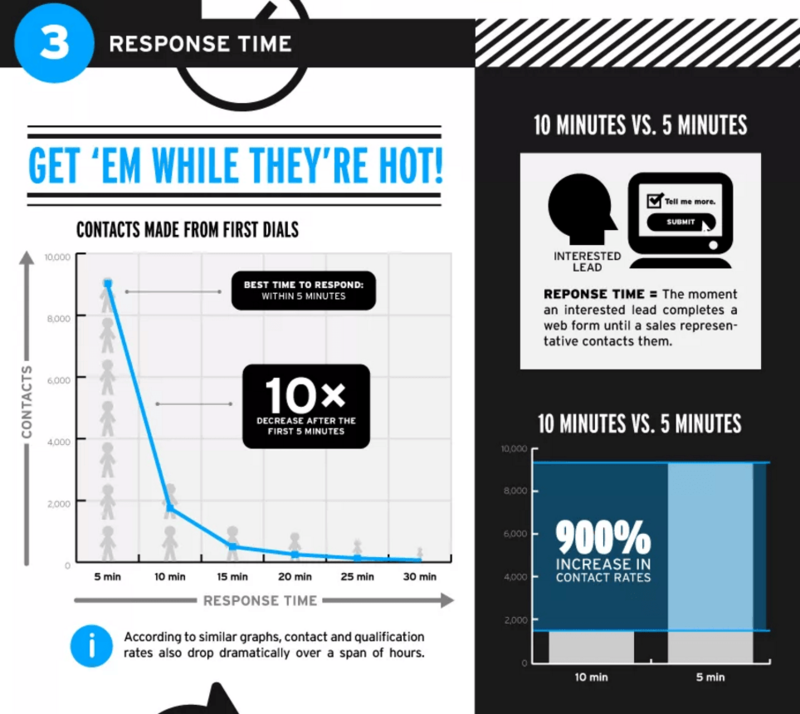 Lead Response Time in the Legal Industry: A Huge Problem? This, or some close variant of it, is the question I hear most from solo and small firm attorneys. They want the email submissions, the phone calls, the desperate voicemails — the leads, in other words. In fact, there is an entire industry devoted to capturing and reselling those leads — the legal leadgen (lead generation) industry, where large companies seed the internet with content relevant to common legal issues, capture contact information from potential clients, then sell a bundle of leads to a desperate solo attorney. But an equally important question is what you do with them when they arrive. Or better yet: when you deal with them. Firms that tried to contact potential customers within an hour of receiving a query were nearly seven times as likely to qualify the lead….as those that tried to contact the customer even an hour later—and more than 60 times as likely as companies that waited 24 hours or longer. The biggest tip, in my eyes, is that the optimal time to respond is not an hour – it’s five minutes. There is also great data on best days of the week and times of day to respond, as well as message frequency. Note that this study is really old — nearly a decade old, in fact. Since then, the smartphone revolution has taken hold and we’ve all gotten even more impatient. By the time you wait an hour or two, that potential client has already called five other lawyers, working his way down the list until he finds a lawyer that fits his budget and answers the phone. Our firm has seen this happen repeatedly, to hilarious effect, when a potential client calls in for one of our attorneys off of Avvo’s big directory and ends up calling back five or six times as they work their way through our full roster, not realizing that we’re all at the same firm (despite our profiles clearly indicating as much). The Harvard/Inside Sales study was not legal industry specific, but does provide a great model for our industry, as our potential clients often need responses even more quickly than, say, a potential home or insurance buyer. Too bad then, that we’re worse at responding in a timely manner. 42% of the time, law firms take three or more days to reply to a voicemail or web-generated form fill from a prospective client. THREE OR MORE DAYS. Not hours, but days. And while this is understandable for solo attorneys with no support staff, understandable or not, it’s still going to have the same result: the client is going to sign with someone else while you are waiting to call them back.